A humidor is a box that maintains a constant humidity. This is essential for maintaining the quality of tobacco products--loose pipe tobacco, cigars, and cigarettes. Essentially any airtight container will suffice, but there are certain materials that are preferred. The humidor will contain a hygrometer, which measures the percentage of water vapor in the air. (Cigars should be kept from 68-72% humidity.) It may also contain a thermometer, because cigars should be kept optimally between 12-25 degrees Celsius. There are humidors that are made from Spanish cedar, or other exotic types of wood. There are also humidors from steel, plastic, and even leather, for a very rich appearance. Wood: There are humidors made from pine, ebony wood, cherry wood, maple, or Spanish cedar wood. The Spanish cedar is preferred because 1) the wood itself holds moisture, so it is better at regulating the humidity, 2) it gives a certain aroma to cigars, 3) it repels the tobacco beetle, whose larvae can destroy dry tobacco leaves. Mantello Cigars makes their humidor from Spanish cedar. Leather: La Cubana makes a travel humidor, which is thin wood that is luxuriously leather bound. Stainless steel: The Whynter CHC-120S is a stainless steel cabinet, which is essentially an electronic humidor. It has a thermostat to monitor the temperature and humidity, and has removeable Spanish cedar drawers and shelves. Leaving the wrapper on the cigars: Cigars typically come individually wrapped in cellophane. This wrapper is not air-tight--moisture can enter and exit through the wrapper. Some advised nonetheless to leave the wrapper on, because it will better preserve the moisture content of the cigars. 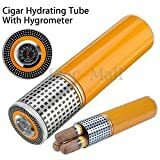 At the same time, others say that it’s advised to remove the wrapper, so that the cigar is better exposed to the humidity and temperature of the humidor. Best to be filled to capacity: Keeping the humidor filled will help keep the cigars at the optimal temperature and humidity. Large-capacity humidors are recommended for cigar stores and dealers. Also, since cigars come in a variety of thicknesses, buy a humidor according to the type of cigar you customarily smoke. Use distilled water: It's recommended to use distilled water in the humidifier. Tap water or mineral water may have minerals that can affect the humidifier, and leave sediments that can cause growth of microorganisms. Distilled water has no such minerals. 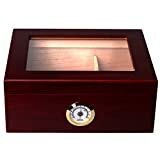 Capacity of the humidor: Humidors are sold by their capacity: You’ll notice travel humidors, such as the Guardsman Travel Black Cigar Humidor, which holds only 10-15 cigars. Then you’ll also see large humidors, that can hold 100 cigars or more, such as those made by Mantello. The humidifier: An important part of the humidor is the humidifier: It consists of a piece of green florist foam, that absorbs water and provides a certain level of humidity to the humidor. Humidifiers come in various shapes: rectangular or round, and some are sufficiently small that they can be carried around when traveling. 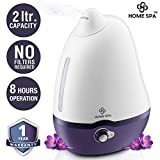 Preparing the humidifier: You take the humidifier out of the humidor, and dampen it in a solution of 50% distilled water and 50% propylene glycol, which is also called an activator: it absorbs moisture from the surrounding air. Leave the humidifier in the solution for five minutes. Shake off the excess liquid, and dry the outside with a cloth. You can now insert the humidifier into the humidor. The distilled water evaporates until the humidity in the humidor is 70%--the propylene glycol regulates the humidity to stay at that percentage. Getting the right humidity: If you see that the hygrometer reads too high a humidity, leave the humidor’s lid open for a while, so that the excess moisture evaporates. If the humidity is too low, it is time to add some more of the humidifier solution to the sponge. Mantello Cigars--are makers of cigars and cigar products. They make humidors of two capacities: 25-50 cigars, or 100 cigar capacity. Their humidors are made from particle board wood overlaid with Spanish cedar, with a hygrometer in the front. They also make cigar cutters, cigar carrying cases, ashtrays, lighters, hygrometers, humidifiers, and more. 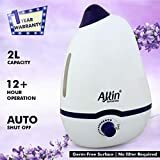 Whynter--makes a number of home improvement products: refrigerators, air conditioners, misting fans, ice makers, dehumidifiers, scales, wine coolers, and humidors. Cuban Crafters--is located in Miami, Florida. They make premium cigars, humidors, cutters, lighters, cigar cases, ashtrays, and other cigar accessories. La Cubana--are makers of humidors. They have humidors of various capacities: 10, 30, or 50 cigars. They have a luxurious appearance, being either leather-bound or with an exquisite wood finish.